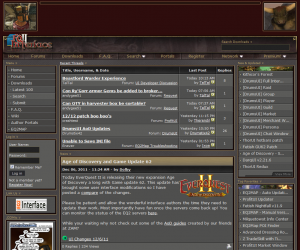 Home » Posts Tagged "Everquest II"
EQ2interface.com hosts UI mods, skins and addons. The site has been around since release and is a spinoff of EQinterface.com. It is the prime resource for mod & interface authors and the download and information hub for users. The most prominent project is EQ2MAP, a full set of maps with user maintained waypoints exceeding the waypoints that come with the standard EQ interface by far. It comes with an automatic map updater. Expect a separate entry for EQ2MAP. Among the fully featured UI’s, ProfitUI is used most frequently and well maintained. There are other UIs like Fetish, eXtreme and Drums. UI compilations, which might not complete rebuilds of the existing UI, Skins, which just change looks and interface pieces like Autoattack timers are available as well. 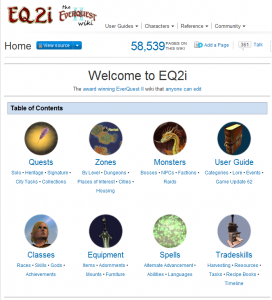 EQ2i is a major resource for every EQ2 player. Guides and articles span many subjects from achievements to zone descriptions. The information find in the articles is generally very good and accurate. The wiki is approaching 60,000 articles with daily additions and updates. Of note are the quest guides which organized in timelines, a collection of quest sequences, usually describing a single zone, but also Heritage or Epic quest. Most often used is the Solo timeline, guiding through quests from level 1 to 90. Another significant timeline is the Dungeon timeline. Additionally, there are zone, monster and class guides as well as tradeskill, spell and equipment guides. In 6 online games SOE has started the 12 Days of Holidays promotion. Starting from Dec, 13, 10am PST to Dec, 24, 23:59pm PST you’ll find daily offers and deals when logging into your game. Participating games are: Everquest, Everquest 2, Free Realms, Magic: The Gathering, Pox Nora and Clone Wars Adventures.